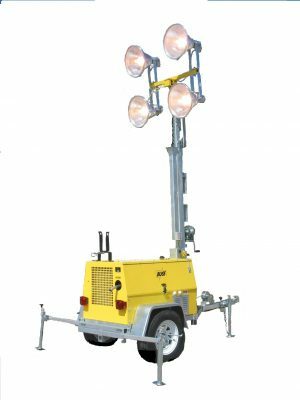 30 FOOT PORTABLE HAZARDOUS-RATED LIGHT TOWER – DIVISION 2 LED LIGHTING with 6kw Diesel Engine Driven Gen-set Package powering 4 x LED floodlights. Lighting system will illuminate 40,000 square feet @ .5fc. Tower is capable of rotating 360*. Manual winch tower with galvanized steel winch cables. Operates for 60 hours. Special Diesel Engine safety features for Hazardous Location requirements. Special Division 2 rated Electrical components, and special automatic hazard detection devices to ensure the save operation in Division 2 area. NOTE: Users of this Hazardous Location Product will be required to pre-approve the use of this product for their specific hazardous area use. BOSSLTG is a UL CERTIFIED PORTABLE EXPLOSION PROOF LIGHTING AND TEMP POWER ELECTRICAL ASSEMBLER FOR DIVISION 2 PRODUCTS. 30 FOOT PORTABLE ELECTRIC POWERED LIGHT TOWERS : 4 X 150w LED Spring Mounted Floodlights – 30′ telescoping tower, NO-GENSET. With 1-20amp 120v Explosion Proof rated receptacle, Floodlights capable of illuminating 40,000 square feet with a 150′ projection of light. 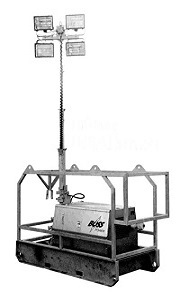 LED light tower products has a specific application in the portable light tower industry. LED creates natural day-light illumination. Crisp clear light for job-site task working clarity. This cost to use this LED light source in expensive compared to the industry standard Metal Halide lights. LED has a high cost compared to equal wattage of Metal Halide. It is true LED can produce what seems to be more light per watt against Metal Halide. More light over a smaller area. LED has limited candle-power. The ability to project light over distance. Where Metal Halide is used in a true Floodlight. With this, MH can be projected sometime several times further in distance than compared LED fixture. In considering LED to MH – if your project calls for less than 200′ x 200′ area lighting requirement LED will produce the best working light. If you require floodlighting over several acres only Metal Halide can produce this. 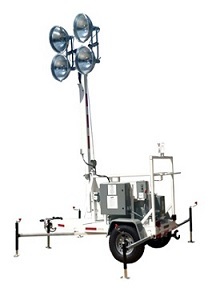 The 30 FOOT PORTABLE ELECTRIC POWERED LIGHT TOWERS has its place in environmentally challenged working areas where space is limited and the restriction of diesel fumes is not good for the working atmosphere. NOTE: This Light Tower package will not be supplied with a Small Diesel Engine. Clients wanting to use diesel engines sized for light towers have to approve the use of a small diesel engine prior to use. Boss has taken all the precautionary safety resolves to make our Boss electric light towers safe for extreme weather conditions. Bossltg is a UL844-P4 Certified Explosion Proof Portable Lighting Assembler as well as a UL1640 Portable Explosion Proof Electrical Distribution Assembler. 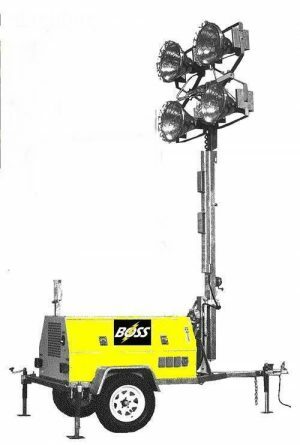 Boss has the experience and the UL Validations to produce all classifications of light towers. You will find that Boss is the only Light Tower Producer in the USA and Canada that has these combined UL certifications. 10 units per truck load.